Photo courtesy of WDTN Crews work the scene of a fatal crash on US Route 35 in New Jasper Township in Greene County Nov. 15. 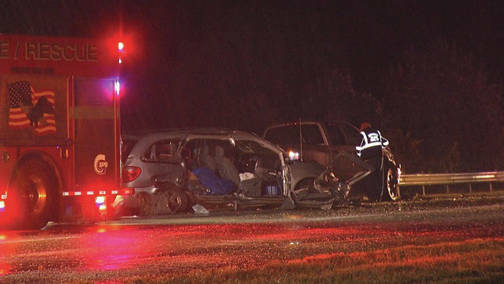 NEW JASPER TOWNSHIP — Authorities said slick road conditions are likely to blame for a deadly crash in Greene County, according to our partners at WDTN. It happened just after 11:30 p.m. Wednesday on US Route 35 west in New Jasper Township. The Ohio State Highway Patrol said a pickup truck hit a slick spot and crashed into a guard rail. A few minutes later, a mini-van hit that same slick spot and crashed into the truck. One person in the van was pronounced dead at the scene. The Ohio State Highway Patrol identified the victim as 44-year-old Ivan Jones from Savanna, Ill.
Two other people in the van and two people inside the pickup truck were taken to local hospitals with reported non-life threatening injuries. Not too long after that crash another occurred near the intersection of 35 and I-675 in Beavercreek. Some reports indicated that more than 10 vehicles including a salt truck were involved, according to WDTN. Authorities said one person was injured in the crash and medics took that person to a local hospital for treatment. Several lanes were shut down briefly. https://www.xeniagazette.com/wp-content/uploads/sites/32/2018/11/web1_accident_ne2018111565426369-2.jpgPhoto courtesy of WDTN Crews work the scene of a fatal crash on US Route 35 in New Jasper Township in Greene County Nov. 15.